The title of the Brighton Photo Biennial 2018 is ‘A New Europe’, a huge theme with almost limitless scope. 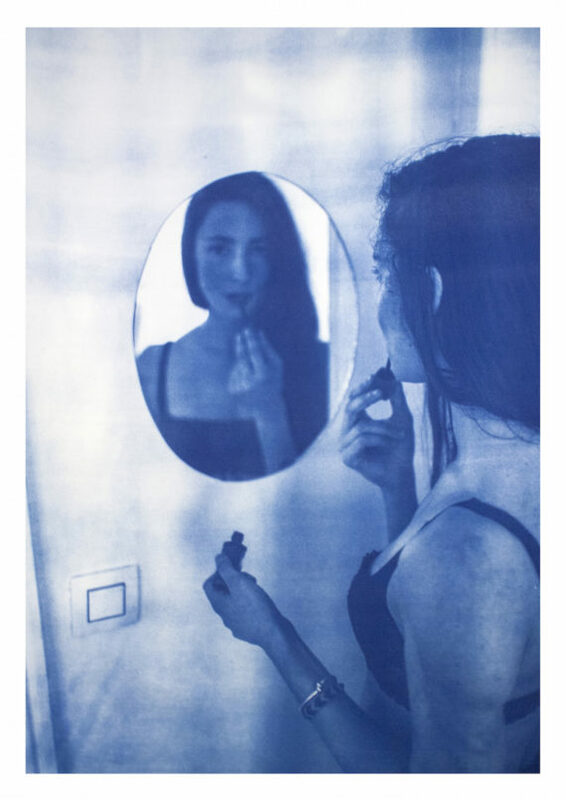 Of course it is particularly appropriate now, although as Photoworks and Biennial director Shoair Mavlian points out, there have been many times in the last 150 years when such a title would resonate. The history of Europe as an entity is one of constant flux. How then to tackle such a theme? Fresh from her role as assistant curator of photography and international art at Tate Modern, Mavlian’s response is an intelligent one, partly born of practicality since she took up the post only eight months ago and has curated the Biennial in its entirety since then. Rather than start with an overarching vision or thesis, she has researched photographic artists working with themes of borders, migration and uncertainty, choosing a selection of those she considers most interesting, and who pose “open questions”. 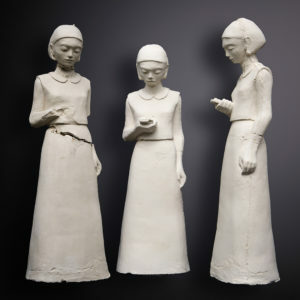 The result is a series of exhibitions from artists working in different ways and from varied perspectives, which as a whole provides an unexpectedly moving, accumulative experience for the visitor. A historical exhibition at the University of Brighton Gallery in Grand Parade provides a useful introduction. Referencing photographic records of the construction of the Channel Tunnel, and the upheaval of landscape that accompanied it, a selection of works by eight artists are shown. Each takes a specific perspective on this mammoth engineering project. Images of naked blue-collar labourers contrast with formal portraits of EU decision makers in their suits, the women aping the seriousness and authority of the men. There are six aerial photographs from Marilyn Bridges, including the epic Bunker (1992) which reveals the huge scale of the works. 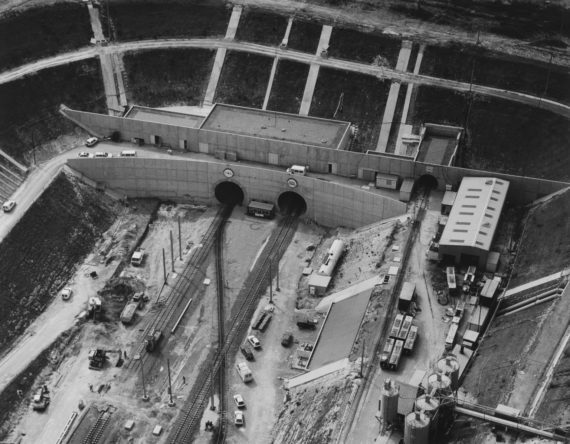 Taken from great height, it shows the two tunnels emerging into daylight, the tracks unfinished, as only one small element of the enormous surrounding ‘bunker’. This introductory exhibition suffers from showing too few works from too many artists, whetting the appetite for more from each, but leaving it unsatisfied. This is rectified by the other installations which allow each artist space to reveal themselves. Emeric Lhuisset has many friends among refugee communities, and has made work around their experience. Rejecting the stereotypical images associated with refugees – as heroic, as victims, and as invaders – his exhibition opens with two powerful works. The first is jerky film of a wilderness landscape, documenting the precise moment when a group of Syrians cross the unmarked border, and therefore stop being citizens and take on the identity of refugee instead. The other is a snap of two cheerful young men on a beach, the last photo Lhuisset has of his friend who disappeared in the Mediterranean while attempting the crossing from Turkey to Europe. 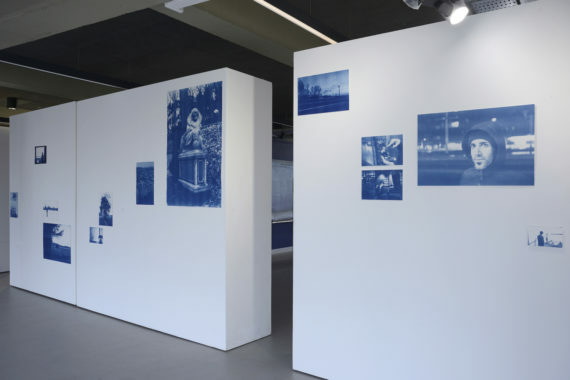 All the works here are printed on unfixed cyanotypes which will fade to blocks of blue nothingness as the Biennial progresses. 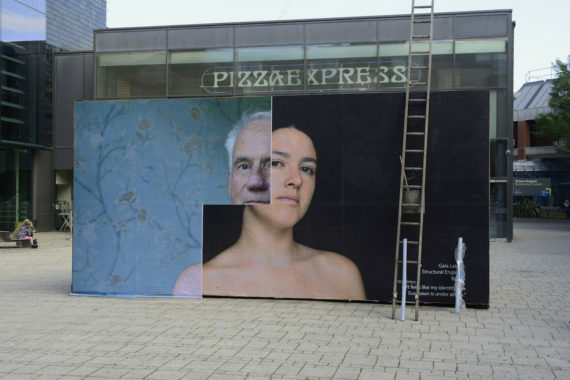 In Jubilee Square, Uta Kogelsberger presents a billboard-size series of 28 head and shoulder portraits pasted onto the back of a shipping container. All gaze directly out at the viewer and the world, some accusingly, some more in sorrow than anger. 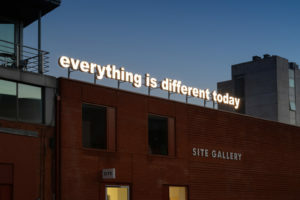 All reflect some form of alienation from the Brexit negotiations in a work that is part way between art and activism. The portraits are changed during four live performances which take place during the Biennial. 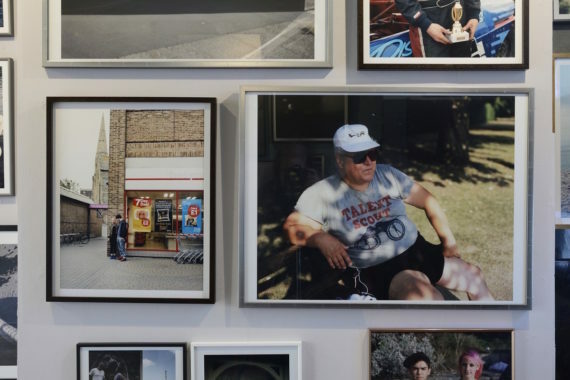 In a disused shop in the heart of the Lanes, Hrair Sarkissian presents his 2014 work Homesick. His octogenarian parents still live in the apartment building in Damascus, Syria where he grew up – it has been hit four times by bombs but they refuse to move. 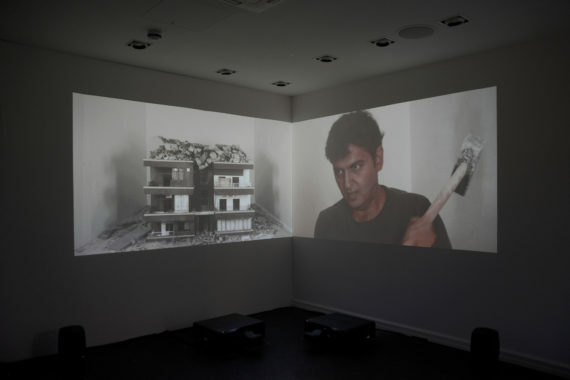 In this two-screen piece, Sarkissian destroys an architecturally correct model of the apartment block, blow by blow – 650 of them over seven hours. It is the only way for the son living safely as an artist in London to express his anger, anxiety and frustration about the situation. In contrast, Nothing We Can’t Fix By Running Away is Robin Maddock‘s wry comment on 21st century Britain. Presenting three floors of mostly documentary photographs, the escapist activities of young and middle-aged Britain are shown without comment. Some are hilarious – a middle-aged man presenting his cactus collection, a couple in full medieval dress in a genteel tearoom. Some reek of everyday reality, such as a group of perfect elegant swans crowding an abandoned sunken shopping trolley, or depictions of the grey aesthetically dispiriting expanses of concrete that permeate civic Britain. 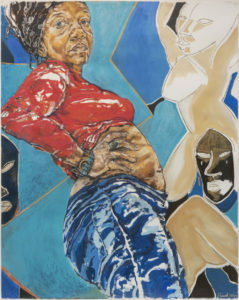 All the exhibitions in this Biennial have something of note about them, and all can be visited in the space of a day. As a whole, they present a thoughtful, gently unfolding experience, international in outlook and considerably less bombastic than in previous years. This change in character can already be seen in Mavlian’s inaugural Biennial, which has a refreshing honesty and lightness of touch. Hopefully there will be more to come. 2. Marilyn Bridges (1948-, États-Unis), “Vue d’oiseau”, Entrée du tunnel sous la Manche, Coquelles, 1992, 37,8 x 48,2 cm, commande Mission Photographique Transmanche n°21, 1996.